Do you feel Autumn in the air? We certainly do and it might just be our favourite season! It's hard to beat Summer, but who doesn't love crunchy leaves under their feet and gorgeous coloured leaves painting the sidewalks? 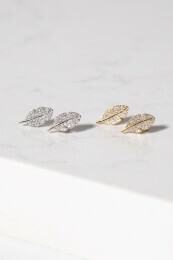 That's why we love these earrings; they remind us of a truly cozy time of year!